These cards are a product of JAQK Cellers, a wine company based in San Francisco, CA, and were designed by Katie Jain and Joel Templin. 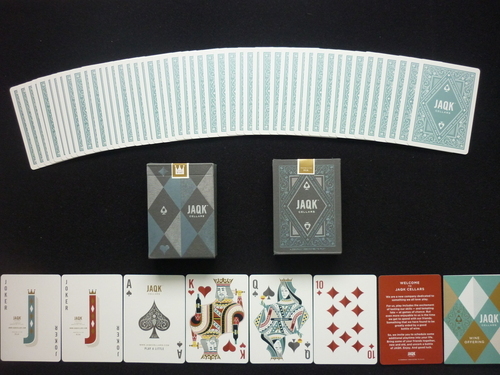 According to their website the cards are printed by an unnamed casino cards manufacturer, although they are pictured on USPCC's website for custom decks (here). They have a smooth type finish and the backs feature metallic ink. The box is printed on a matte stock and utilizes both metallic ink and embossing. Comes with two custom different colored jokers, custom faces (AoS, court and pip cards) and several ad cards.